The base 16 hexadecimal human bio-computer BATTLE reports have increased in recent years. This year 2013 report will outline some CLUES to consider in the study of Nature's signals VIA programmable human bio-computers ---> human DEMO devices for Nature's instructions. The recent shooting rampages and their hematology DISPLAY of B100D --> imply --> RAM bio-computer PAGE errors ..... in the human b100d data processing system. transfer between main memory and any other auxiliary store, such as a hard disk drive. Systems. IBM System/370. Principles of Operation. The IBM System/370 is a data processing system that is based on the IBM System/360 but that extends the. The 1st major BASE 16 war casualties occurred with the 16th Street Baptist Church bombing. The EARTH LAB event occurred on the geography surface of EARTH in an ALGEBRA LAB region that is a subset the earthly mathematical-physics surface. Thus we see the Base 16 hexadecimal data processing WAR event in 1963 and its logarithms ratio signal 16, 160, 1600 --> message to 1600 Pennsylvania Avenue, Washington, DC. Let look at some newspaper messages about chromosomes and blood systems. First, let's look at biological time signals printed in news reports about clocks and watches. Then we will look at the MAX signal of the MAX project plans (via human agents) of MAX PLANCK time. There was a good buzz in the Geneva auction hall over the weekend (May 14-15) as Antiquorum's Important Modern and Vintage Timepieces sale got underway. With an impressive variety of both antique and recent wristwatches, pocket watches and clocks from watchmaking legends going under the hammer, there was something for everyone on offer. As expected, one of the big hits of the sale was a Breguet silver carriage clock with 10 complications. This was one of his silver humpback carriage clocks of which only a few were ever made, (1812). 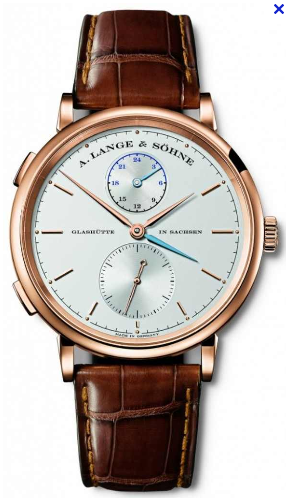 The complications include moon phases and equation of time. Accompanied by the original Breguet gold-tooled red morocco travelling case, Breguet silver key and certificate, it sold for CHF205,000(currently equivalent to $230,000) - in the upper half of its estimate range. It will make someone an excellent investment. At the same price, but a more decisive hit, was Louis Audemars "Grande Complication - "La Russe II", No. 12199, retailed by G. Aspe, Paris in 1896. Started in April 1873, and finished circa 1880, it was sold to Monsieur P. Hebert for 3240 Francs. 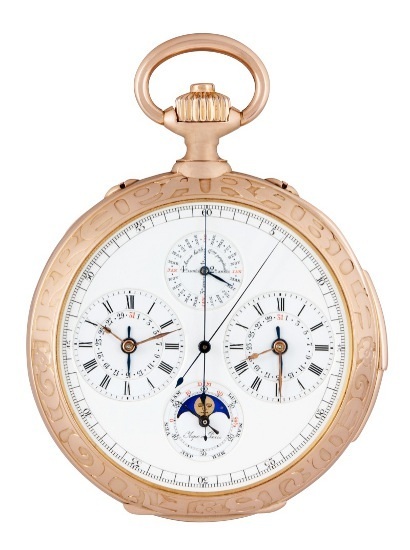 It was described by the auctioneers as "one of the most important complicated watches of the 19th century". With double perpetual calendar for both Julian and Gregorian systems, as well as minute-repeating, two time zones and a chronograph, it had been expected to sell for CHF100,000-150,000 but likewise reached CHF205,000 ($230,000). chron·o·log·i·cal (kr n -l j -k l, kr n -) also chron·o·log·ic (-l j k). adj. 2. Relating to or in accordance with chronology. with the " WHY 2K" data stream pipeline ability. In year 2013 , this is known as the missing Y2K brain subroutine. Modern hematology data processing theory tells us about Nature's new version of alpha/numeric B100D. SYMBOL MACHINE analysis of the Virginia TECH English department word of HONOR of B100D error tell us . . ..
B100D ---> alphabet letter B + number 100 + alphabet letter D.
Base 16 hexadecimal X'100" = 256 --> implies level 256 is needed to help resolve the Hierarchy Problem in physics professors ..... known as the SYMBOL MACHINE bio-physics problem in practical communications with analysts studying Nature's system messages. X algebra chromosome, the function of (x) chromosome, and the hexadecimal X'100" = Base 16 chromosomes. Thus, news announcements about clocks and watchs .... sometimes provide secondary CLUES to other puzzles about TIME and human life, etc. Now let's look at MAX PLANCK and Nature's project signals. Of interest, was an article on Barron's weekly financial paper about TIME. . Nature's SYMBOL MACHINE identifier --> Barron's --> subset letters imply --> Ba + arr --> Base array. Some of the above proper nouns have a dual Nature .... a double-helix SYMBOL meaning ..... they may also MAP to a another earth geography region .... space/TIME dimension. Lutheran --> implies computer science LU = Logical Unit. Evangelic --> DR. Robley Evans 1955 MIT physics textbook " The Atomic Nucleus"
18 --> implies water molecule mass 18 --> H2O --> water continuum --> implies the samll communities of Watertown, Water100, and Whitewater in South Wisconsin. In this region of Wisconsin is Interstate highway I-43. In the space/TIME imformation dimension ..I-43 --> Interger ten exponent -43 --> 10 exponent -43 --> Max Planck TIME region on the geography surface of EARTH. 100 --> implies word B100D --> an alpha/numerics word --> letter B + number 100 + letter D.
16 refers to Hexadecimal Highway 16 in south Wisconsin. 16 refres to Base 16 hexadecimal B100D --> with number 100 --> Hex"100" = 256 lervel of B100D ..... a message regarding the Hierachy Problem in bio-physics b100d SYMBOL analysis. 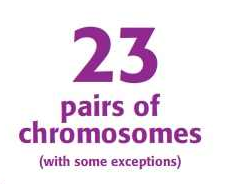 $230.000 --> the 23 chromsomes. I, bio-time MAPPING agent HMZ. was born in year 1900 + 43 years (1943) at 2338 N. Second Street in Milwaukee. Now a major CLUE came from the Milwaukee police department shooting of Norberg. That EVENT involved guns that were sold by Badger GUNS at 2339 S. 43rd Street in Milwaukee. I read the Milwaukee Jourmal Sentinel Newsaper article on the nasty EVENT ...my conscious MIND was oblivous to the signal within the EVENT adjectives, numbers, and nouns,. However, my eye/ retina /pupil and the optical berve sent a copy of the article to my subconscious mind,etc. My Carl Jung collective unconscious worked on the newsaper information .... and months later my conscious mind had the IDEA .. lets's review that article. Using the iNTERNET computer I found an equivalent article that mentioned the Norberg and Badger GUN data base info. I took a 8 1/2 by 11 pad of paper ..... and started to write some things ...... what is it? 2339 S. 43rd f Street --> 43rd --> 43 research and development (projects of Nature's INTELLECT). Chronology is the science of arranging events in their order of occurrence in time, such as the use of a timeline or sequence of events. Thus we see a NEXT sequence number in some system of NATURE ...and the SYMBOL MACHINE messages that Nature is giving us. The the Barron's article contains some messages about the deeper levels of REALITY that exist and are not obvious .... to ordinary folk like myself. Thus is summary ... a human adult individual may take his biology X-chromosome and enhance it with algebra equations and Base 16 ...such as X'A' = 10 and X'F'=15. Thus we see Darwinian evolution of BLOOD. its intellect, and its symbol processing abilities. And we see Nature's biochemistry systems ANGER displayed VIA the various shooting rampage B100D demos ......Fort Hood, Sandy Hook, April 16 at Virginia TECH, etc. Perhaps, someday ...someone will help research this. Jun 15, 2013 - Science's hunt for a unifying account of how the world works requires us to entertain everything from hidden dimensions to multiple universes.